Also known as Featherfew, Flirtwort, Febrifuge, Batchelor's buttons, Featherfoil, Midsummer daisy, Nosebleed. A hardy perrenial growing up to 40 cm with numerous small daisy-like heads, a hairy stem and serrated leaves. Feverfew has now been recognised as the 'migraine herb'. 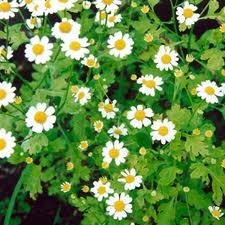 It is said that feverfew should ideally be taken in small doses as a prevention as it has little effect once the migraine has started. Particularly useful for migraine sufferers who are affected by their menstrual cycle. It is also helpful with arthritic and rheumatic pain and has antihistamine properties offering relief to hay fever sufferers. 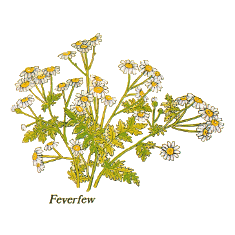 In Roman times feverfew was used to expel the placenta after a difficult birth. It also used to be used as a flea repellent.